Hiunchuli, with Annapurna South, forms the massive south-facing wall, well seen when trekking north from Pokhara. Huinchuli is the eastern bastion of this rampart, with its East Face overlooking the Modi Khola, guarding the entrance to the Annapurna Sanctuary. An impressive mountain in its own right, and not, as it was at one time dubbed, ‘the eastern outlier of Annapurna South’. Despite the relative ease of access to the mountain and the popularity, rightly so, of the Sanctuary as a trekking destination, it has, like Fluted Peak, received little attention from mountaineers although it obviously offers major new route potential. From the south, Huinchuli has few weaknesses in its defenses. A precipitous south wall rises above the untracked Chomrong Khola, seemingly menaced by snow avalanches from the slabby, ice-veined buttresses above. The eastern flank from afar appears the most approach- able; however, once beyond Kuldi Ghar, it seems far less so. Out of sight, the mountain remains an unknown quantity approached by only a few, through steep and dense bamboo forest, menaced by unseen avalanche danger from hanging glaciers above. From the north the mountain rises steeply above the moraines of the Annapurna South Glacier in a series of slabby buttresses and an ill-defined and complicated North Ridge. These in turn lead to a final triangle of fluted ice that form the summit. 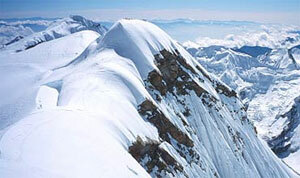 The summit is bounded on the east by a ridge that rises in an icy parabola from a small Col , from which a steep coulors descends towards the moraines above the lodges at base camp. This is a feasible looking route, and is as yet unclimbed. The mountain’s western arm is the ridge connecting it with Annapurna South, and forming from the north an icy wall. It is this wall that has provided the key to new things. Hiunchuli was first summited by an American Peace Corps Expedition under the leadership of Craig Anderson in October 1971. Although it is easy to reach the mountain and the popularity of the Annapurna Sanctuary with trekkers and climbers, the actual ascent of Hinuchuli is considered one of the most difficult among the trekking peaks. South-East Face Route: The route to base camp starts from Hinko Cave on the Annapurna Sanctuary trail. After establishing the first camp somewhere above the valley floor a further 2 camps are necessary to make it to the top. Although not technically extreme this route is exposed to rock fall dangers and is a complicated route-finding experience. North-West Face Route: The ascent by the North-West Face has been attempted only by a very few climbers and not always successfully. The exact route is not well known. The approach is from the Annapurna Base Camp in the Sanctuary and a further 2 camps may be necessary to complete this not so well known ascent.